OK! enough about him. Hope you don't mind my rambling. Here's sharing with you a wire wrapped cab I completed last night. Another one to go. Great wrap Mei:) And whew it sounds like you have your hands full with the little one! 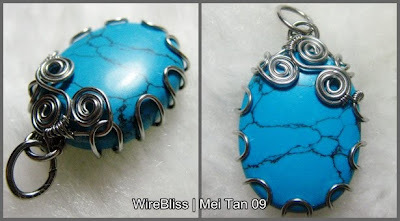 I love your wire wrapped cab Mei, just gorgeous!!! Poor Henry...is there something he doesn't like or someone at school that he doesn't get along with??? I managed to get him to school today.